A Rabbit in the old blue and cream DB livery emerges from the gloom at Brandenburg Hbf with a Stendal-Berlin train. Another year, another fiasco… Ryanair started well with a punctual departure from Stansted at 0640 but after many circles over a foggy Lübeck we were diverted to Hannover, arriving at about 0950. At Hannover, chaos reigned. A free bus to Hamburg was on offer, but nobody seemed to know when so I retired to the airport station in time for 1108 to Langenhagen Mitte and thence 1121 to Bennemühlen. [You get what you pay for, of course. But without going into all that I saw and heard, Ryanair appears to have an attitude problem.] So far, so good. Unfortunately on arrival at Bennemühlen at 1145, the next departure for Soltau was at 1345. And to add insult to injury it’s an Ormskirk type operation with S-Bahn electrics and Soltau DMUs using south and north ends of the same platform and two loops, one bypassing the southern part of the platform and one all of it. Ah well. Nothing for it but to find a pub. 30 mins walk up Wasserwerk Str. and back down Mittestrasse brought me back to the station and an add for Kreuger’s pub which was just beyond where I got to. A further 40 minutes walk got me there and back - it opens at 1700. The day being a virtual write-off now, I’ll have to see how long the daylight lasts. Having bought a Coke and a beer in a shop I fortunately only drank the Coke, as when the DMU arrived the toilet was ‘defekt’ and it was a long time since Stansted… A further 1hr 20 to Soltau proved taxing in many ways, not least that it’s very, very flat and very, very boring particularly when it’s very, very foggy. Soltau provided a clean and tidy loo (phew) and an English speaking booking clerk enabling me to pick the cheapest fare to Schwerin (DM 54.20). Total fares for the day were 74.40 thus an overspend of just over DM 30 on the originally planned 3.80 + 40.00. Best of all Soltau had a station bar, perfectly presentable even if it did look forbiddingly shut from the outside. Haake Beck Pils was manna from Heaven under the circs. ‘Yellow Submarine’ on the radio must have been a challenge to the locals (not to mention that nice Mr Woodward from Pontypridd with ‘The Green, Green Grass of Home’). 1555 Soltau (Han.) - Buchholz (Nordheide) completed the day’s visible gricing. Unfortunately there are two long crossing stops otherwise the main line could have been reached in daylight. As it is, Buchholz (Nordheide) to Büsenbachtal should be done again when time permits - and fortunately, should allow a quick turnround. Buchholz (there was in the end still a glimmer of daylight) seemed like the last place on earth but proved on closer examination to have a warm waiting room with upholstered chairs and a table. 1719 RE to Hamburg provided more surreal entertainment with someone’s mobile playing ‘The British Grenadiers’. At Hamburg Hbf the previous printing of a street map paid dividends in finding the Gröningen. And a fine pub it is too; unfortunately with only 15 minutes available, only the Pils could be sampled. It’s very unusual – reddish brown and quite sweet. Somewhere between a French Ambrée and a brown ale but much nicer than either. Expensive at DM6.10/0.4l. Food looked good too. Ropes learned, I was back to H-Hbf in 6 minutes in good time for 1834 to Schwerin which ended the day’s travel in reasonable comfort behind 110330. The InterCity was expecting me (though believing me to be American) and all was well until I went out to supper to the Güten Quelle (q.v.) and found it closed for refurbishment, reopening on Sunday. Ended up at McDonalds. Well, at least it was cheap, offsetting some of that DM30 and I got to bed earlier, though not early enough by several hours. Up betimes (and be-fore breakfast) for 0607 SE to Wittenberge. After a lethargic start I had time to get a coffee at the station before the train arrived from Wismar. At Wittenberge the planned breakfast strategy failed completely, there being only a coffee/sweetshop available. Another coffee at least added extra warmth! 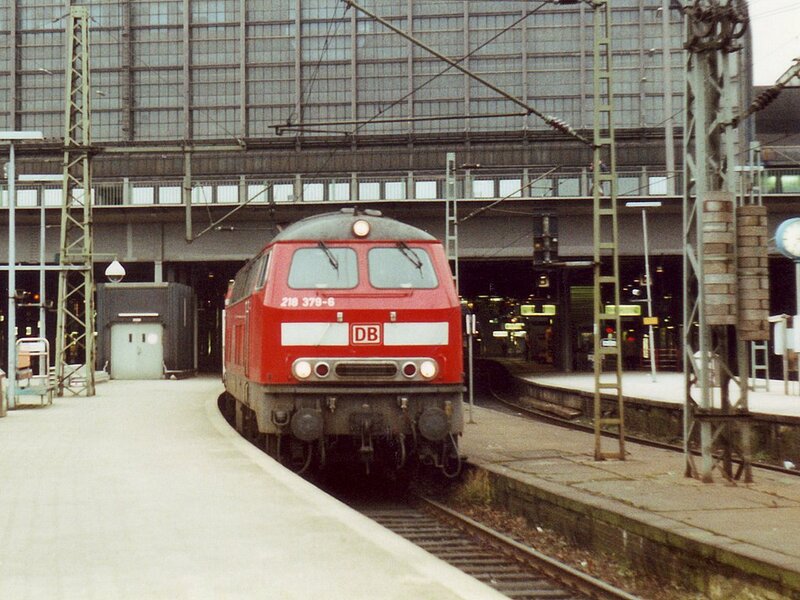 A Ferkeltaxi and trailer provided transport where I discovered (just as the DB train left) that PEG had completely recast the timetable for the Putlitz branch, effectively destroying the day’s plan. Off to Neustadt (Dosse) therefore, over done track and in one of PEG’s Little Puce Coup(é)s. This seemed to have its own agenda too but arrived at Neustadt just in time for 1025 to Rathenow, another LPC as it turned out. This is another flat trundle through pine woods and fog! To be fair the fog is thinning a little - who knows if it’s enough for Ryanair. [Not really a fair dig at Ryanair. There is a clearly defined safety regulation governing the visibility (distance) required for both take-off and landing.] The station buff at Rathenow (where the Neustadt and Brandenburg lines use a separate platform) was open, mercifully, for yet more coffee. [The station was rebuilt later and the separate platform isn’t used any longer.] Onwards on a 628 to Brandenburg Hbf. Before B-Altstadt there is a huge recycling plant which seems to specialise in rail vehicles (I couldn’t think what else ex-Belgian kippers would be doing there). All very modern and clean and tidy. Brandenburg Hbf is fully modernised now (not like in 1992) and has a full range of facilities. 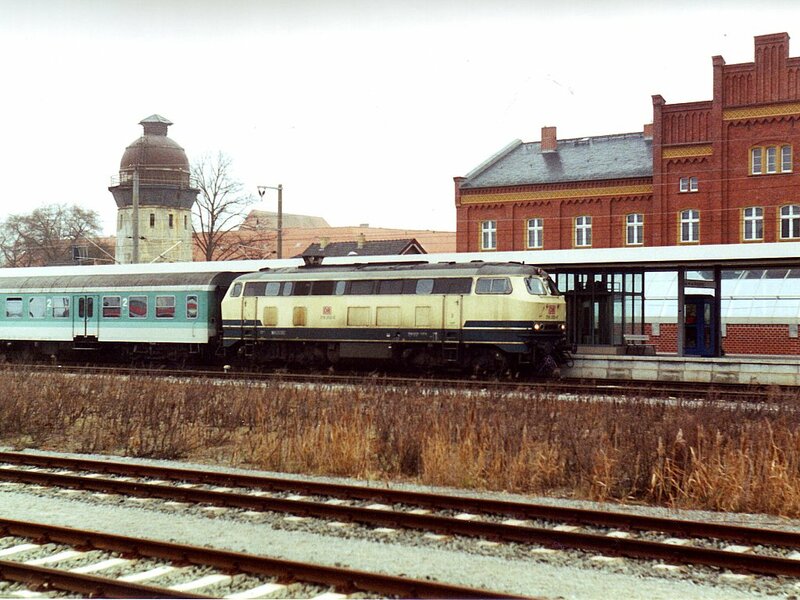 There was however insufficient time to patronise them before 112-hauled 1238 RE to Magdeburg. The fog has now cleared and been replaced by anticyclonic gloom - hope the same happens tomorrow (or it doesn’t appear at all!). Bratwurst, Hasserode and hazy sunshine at Magdeburg. For once I like the place. This was a welcome 40 minute fuel stop before 1413 to Uelzen, propelled by 143131, which ran with great precision to Stendal. Here the 14 minute booked stop offered scenes of the early Great Western with everybody piling in to the sandwich stall. The fog has now returned to replace the gloom; it must depend how far north you are. Onwards from Stendal to Uelzen through more exceptionally unexceptional countryside. Arrival at Uelzen at 1635 was in daylight so no problems there. Uelzen is one of the more unusual stations I’ve ever seen - fully refurbished in a style difficult to describe. Pillars with something resembling vases in them. White rendered walls with brick topping. Haphazard stretches of brick. Spiral staircase to the first floor with mock adobe walls. Etc. Most, er, distinctive. The 1701 double decker to Hamburg was something of an anticlimax. However the fog cleared again, so all is not yet lost… Excellent mayonnaise-free smoked ham sarnie at HH-Hbf. Various unsavoury characters lurking outside; a fight broke out but they all seemed to know each other so best left, in the interests of personal safety. Acceptable Holsten Pils, if that’s not an oxymoron, in the Zapfhahn before catching 1834 to Schwerin, again. Given the apparent absence of decent pubs within walking distance, an early night was had. Rabbit 218 379 waits at Hamburg Hbf with a Lübeck train. Another very gloomy morning, improved by a hot shower and pleasant, if unspectacular breakfast. After an attempt to charge DM200, the very amiable receptionist accepted my (absolutely truthful) assurance that I hadn’t had breakfast yesterday and we settled at 180. After some (non English speaking) debate at the station the booking clerk convinced me that you couldn’t buy a Schleswig-Holstein-Ticket on Sundays. It also looks as if the SWT isn’t valid on the Hamburg U-Bahn so no escape route from Norderstedt Mitte. Off behind 110330 on the 0918 Schwerin Hbf - Hamburg Hbf so at the third time of asking I’ll see this line in what passes this weekend for daylight. Büchen is situated in the ‘V’ of KBS100 and 145 just east of the junction, therefore from or to the north it should be done on a through train to ensure the connection. DB lady at HH-Hbf assures me that SWT is OK on the U-Bahn so I’ll keep that idea in reserve… Toyed with the idea of S-Bahn to Pinnenberg as it goes a different route but the 5 minute connection looked iffy especially as the S-Bahn train didn’t appear on time. I decided to stick to plan with 1118 RB to Elmshorn (and on to Kiel) behind 110479. 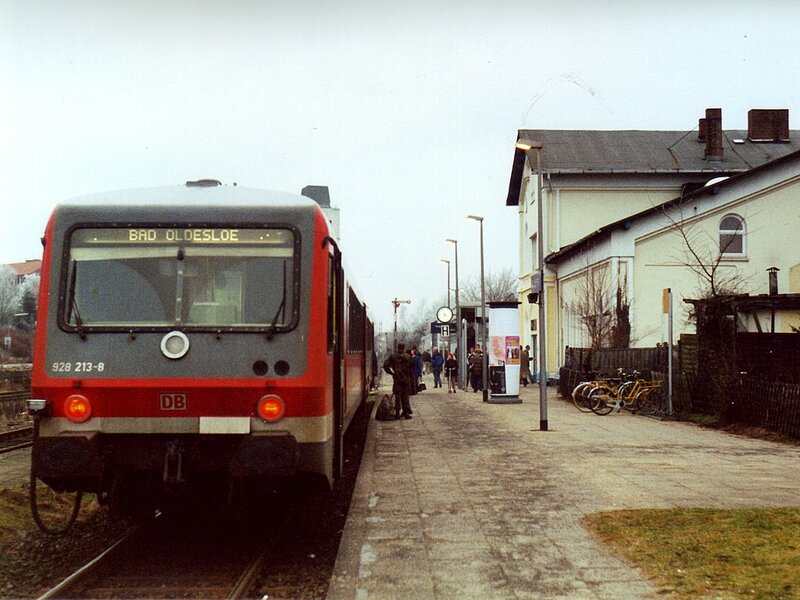 At the time Bad Segeberg was a terminus, though the line has now been reopened north-westwards to Neumünster. My 628/928 unit is waiting to return to Bad Oldesloe. Just about the nearest I got to daylight all weekend! The AKN kart to Ulzburg Süd was waiting when I got back from the pub. 2 car, reasonably modern DMU with vinyl seats. Not much in the way of windows, probably awful if it’s hot. The whole system seems to be modernised, with some very unusual track in the loop at Sparrieshoop - quite heavy section rail but the ‘sleepers’ are steel plates in an alternating ‘Y’ arrangement. Everything connects very efficiently at Ulzburg Süd with Elmshorn and Norderstedt terminators sharing the centre line (fortunately) and Neumünster - Hamburg and v.v using the two outside lines. A very expensive tunnel and new station have been built at Ulzburg ‘proper’ presumably to take the line under the road system. The physical junctions are a short distance north of Ulzburg, and immediately south of Ulzburg Süd. There being little to be gained by doing half the Neumünster - Eidelstedt line I opted for U1 back from Norderstedt to Hamburg, decamping at Meusberg in the hope that Gröninger was open. In keeping with the rest of the weekend, it wasn’t - opens at 1700 (1130 weekdays, wouldn’t guarantee Sunday evening at all). On therefore to HH-Hbf and a diabolically expensive Franziskaner at A.F.Nagel’s opposite the station. Quite a fine pub, it must be said. Back at HH-Hbf Rabbit 218379 was waiting with 1510 Lübeck. A brisk run ensued to Bad Oldesloe with the usual sound effects; arrival was on time and a 628 was waiting to go to Bad Segeberg. It looks as if the physical connection is before the station but with main line platforms one side and bays the other, it’s a bit academic. Bad Segeberg had a 5 minute turn round so after the statutory phot I dived back into the train. At Lübeck the bus station proved to be just across the road (though through some buildings as well, so not visible) and surrounded by cheap (as in cheap) hotels. There seemed to be some better ones if you were prepared to walk a couple of hundred metres. The bus to the airport turned up on time and decanted us right outside the terminal building. A perfectly efficient way to get to and from Germany, provided you’re not too fussy about when/where you arrive/depart. I fell, yet again, into the trap of a ‘quick’ beer but did just manage to get a weissbier down before final call. Ryanair were being rigorous about hand baggage weight; luckily I had removed my camera and was OK but my neighbour had to do a quick rearrangement. Flight back to Stansted and drive home were completely uneventful apart from some antics with the engines approaching Stansted.